I’ve been wanting to play this gorgeous, modest album for quite some time, but holding off until we were at my house so that people could feel its beautifully-rendered synthesisers emanating from my speakers. Not that there’s anything wrong with anyone else’s speakers; just that I know that Clean Cuts sounds mighty fine through mine, and I didn’t want to risk a sub-optimal first impression. Except that 2012’s Clean Cuts, despite being House of Blondes’ debut album, wasn’t my first impression of House of Blondes; in 2007 a band by the same name, led by the same man (New Yorker John Blonde) released another debut album (there’s quite a backstory regarding how I came to hear them in that linked article). That band was a decent-enough indie coterie with some gently florid tunes, and I enjoyed their eponymous record. The House of Blondes that released Clean Cuts early last year is a synth-based three-piece however, and sounds almost completely different bar a few melodic similarities which seem to come, understandably, from the fact that the same guy is singing the songs. Beyond that, though, the analogue pulse, drift, reverberation and oscillation of this record sounds completely unlike the faintly folky guitar piano bass drums of House of Blondes mk1. And I’m glad, because while mk1 was nice, mk2 is wonderful. Clean Cuts is, to my ears, almost perfectly pitched and sequenced as an album of this kind; there’s an exquisite balance between “songy songs” and “tracky tracks” (as I so eloquently put it on the night), much like on Burst Apart by Antlers. ‘Ego songs’ – tunes that demand your attention, want to be hollered along with, be a single or thought of as an important statement – can be tiring if over used, as they often are on BIG. IMPORTANT. RECORDS. where every song matters and there’s no room to breathe. I’ve always liked the moments in between the ego songs, the segues and instrumentals and low-key songs and ambient wibbles that act as respite and palette cleansers, giving you space to just enjoy the wonder of recorded sound. Clean Cuts has those moments in abundance, and even the “songs songs” never stray fully into ego territory; as a result I’ve never grown tired of this record, despite having played it over and over and over and over again. And the “tracky tracks”, although occasionally beatifically absent and vatic, always feel like something more substantial than sheer ambience. 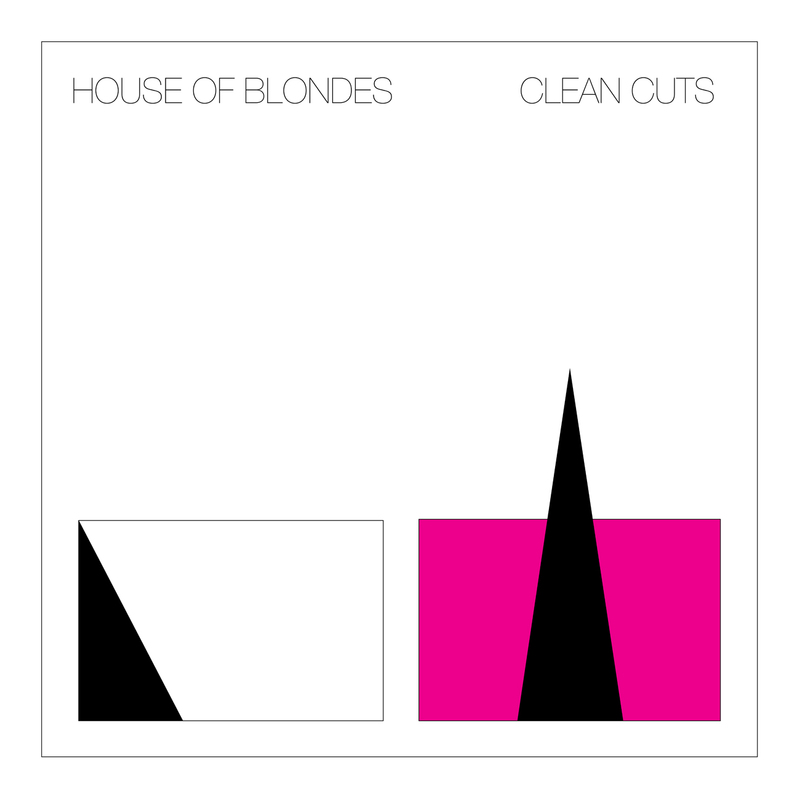 In terms of influences, similarities, and sound-alikes, you can draw obvious lines to New Order, Gary Numan, Bowie’s Berlin trilogy, Suicide, OMD, and countless other synth-oscillators over the last 30-40 years, but to do so is a little reductive; House of Blondes are their own thing, and very good too. The question of what happens to make some bands get picked up and go over the precipice into wider awareness is a strange one; Clean Cuts is self-released but as good as anything I’ve heard on an established record label. It’s one of my favourite records that I’ve come across in the last 12 months. Rob listened: Liked this a great deal. Mainly on a purely sonic level, the sounds were lovely and assembled with exquisite care. Secondly, it seemed to chime with the Pinkunoizu record in that it took influences which it seemed happy to display, but wove something new and exciting from them. That’s a tough thing to do and when it’s done right it hits a big sweet spot. Tom Listened: Whilst sharing only the slightest of direct musical similarities, Clean Cuts seemed to share much common ground with Rob’s offering – Pinkunoizu’s The Drop (to be honest, most records surely will have some common ground with The Drop). Both are records from bands that are so far off the radar that I haven’t seen their name mentioned yet at all in any of the end of year best of lists I have glanced at. Which is simply wrong – both sound to me worthy of adulation and respect….much more so than many of the records that have found their way onto said lists. And both are records that sound unencumbered by the weight of expectation, records made by people who are simply doing what they have to do, just getting it out there. Both are records that I will probably end up buying. Fantastic stuff. Graham Listened: Sat nicely alongside Pinkunoizu, though a lot more sophisticated and mature than the cheeky upstart. Lots of reference points to electro that could be dubbed “my era”, which made it easy to get on with.